“Swap that Gift Card for Cash”. The write-up focused on two sites – PlasticJungle and GiftCardRescue. Both are services for offloading unwanted gift cards. While the article seemed only to consider the selling opportunities I was amazed they didn’t bring up the BUYING potential of these sites. Sure gift cards are limited to specific stores, but these cards are being sold for less than what’s on them – that’s an immediate discount! So I decided to browse around and see what was available. Here’s a little breakdown of what I found. All the listings are shown as percentages off the cards’ face value. Okay I’ll admit these aren’t cut-rate discounts, but I never like paying full price for anything. If you have regularly occurring or known upcoming expenses, like pet supplies or travel, then these could be a great way to shave some of the sale price. 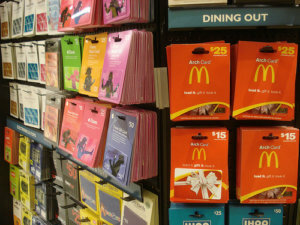 Out of the two, PlasticJungle hosts gift cards with no expiration date while GiftCardRescue sells expiring cards exclusively. With that, you can probably snag a deeper discount, but should be fairly certain you’ll use the card in its full amount before the expiration date. If anyone happens to make a purchase from either of these, let us know how it works out and if it’s actually worth it.